Wipeout TV show on ABC: canceled, no season 8? It’s looking like Wipeout is all washed up on ABC. The competition series hit some lows in the ratings last summer, was left off the schedule this summer, and now, it’s been removed from the network’s website. 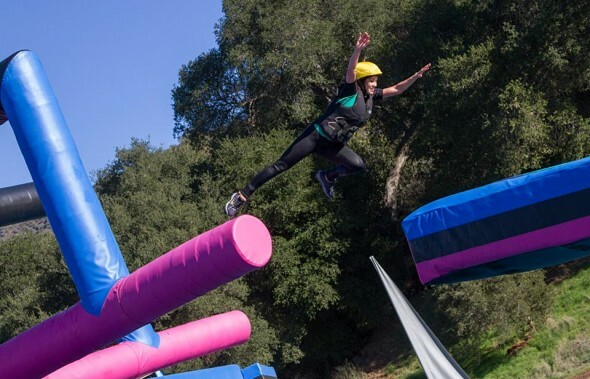 On Wipeout, contestants try to make it through the “world’s largest obstacle course.” The person that makes it in the shortest time wins a cash prize. The program is hosted by John Anderson, John Henson, and Jill Wagner. The show’s ratings have been coming down over the years and the seventh season was no exception. The 12 episodes, which finished airing in September 2014, registered just a 0.97 rating in the 18-49 demographic with 3.52 million viewers. That was down about 10% season-to-season. Some assumed that the show had been renewed because applications were being accepted for a new version of the show called Wipeout Extreme. However, it’s worth remembering that it’s not uncommon for production companies to do that to prepare in case another season gets greenlit and needs to be produced quickly. ABC hasn’t publiclly renewed or cancelled Wipeout but the network has now removed all traces of the show from their website. They could bring it back at some point but, for now, it looks like Wipeout is done on ABC. What do you think? Do you like the Wipeout TV show? Would you like to see it return for an eighth season — on ABC or some other channel? Miss this show, please bring it back. This is a great family show and my family and I miss it greatly. Please bring Wipeout back to the U.S. . It was my favorite show. The 2 Johns were very funny! I miss this show immensely. We need more fun shoes like this in t.v.. Sitcoms just don’t cut it anymore. Bring it back. My whole family lived watching it and it made us laugh, so we would love to see it come back. Also with the same John’s and Jill. Please bring back Wipeout along with the two Johns!!! Jill and Vanessa are very entertaining as well. My family loves this show and it is child friendly. This show is needed so much in today’s crazy world and provides much needed stress relief through belly laughs and fun. There is not another show on tv that can make us laugh like this one!